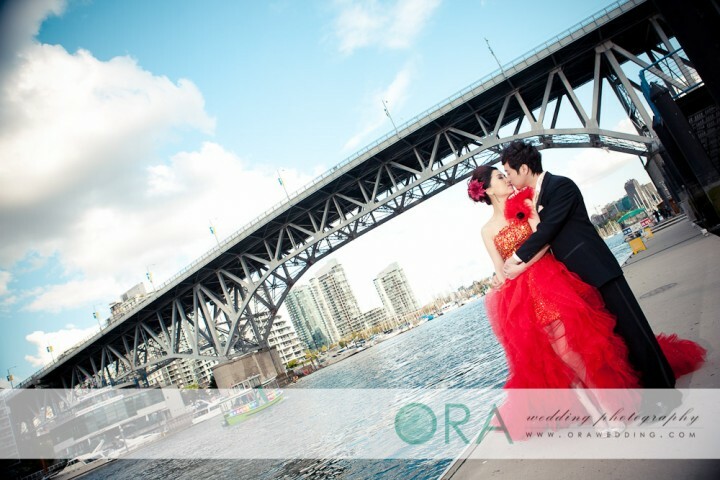 Pre-Wedding Photography: Summer’s almost here, Vancouver! Don’t forget the blue skies and beautiful lush scenery. Someone told me it snowed today (???). Well move over weather, because we have some lovely couples to work with this coming season. 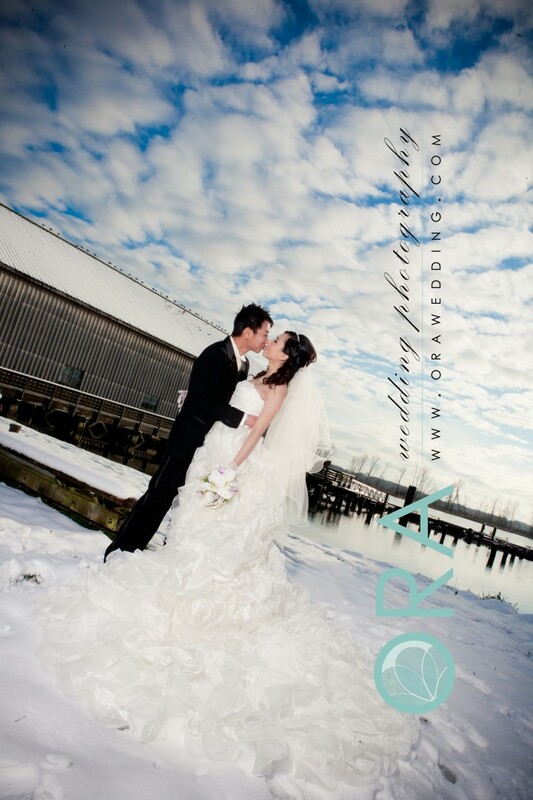 Last year we proved we could do anything when we photographed Ivy and Jason in the snow for their pre-wedding session – remember that? 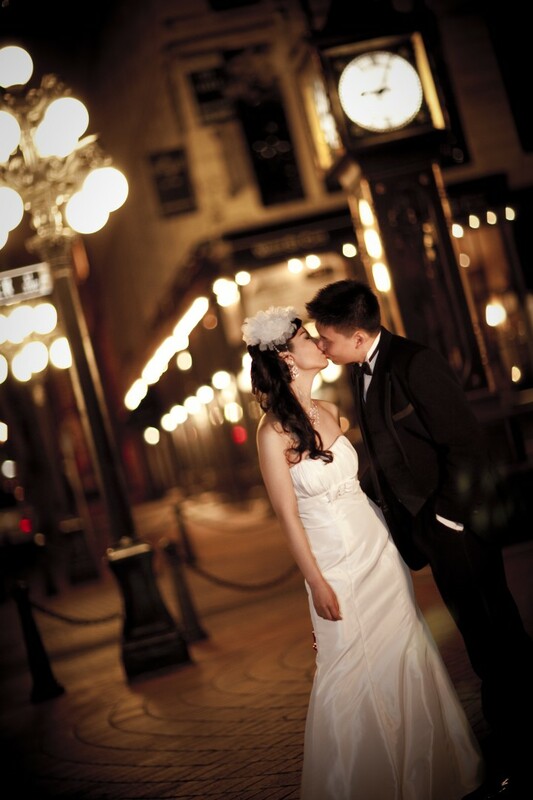 This year we are prepared and excited for all our 2011 and 2012 couples to experience their once in a lifetime pre-wedding session with us. P.S. If you’re looking for our cherry blossom favorites, click here. 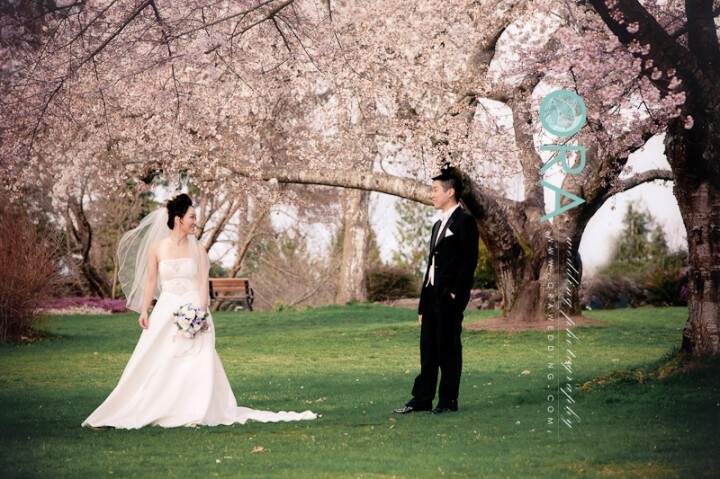 Cherry blossoms (or sakuras) are one of our most in-demand photo shoot seasons of the year, and every year we have couples coming in specifically requesting cherry blossoms. 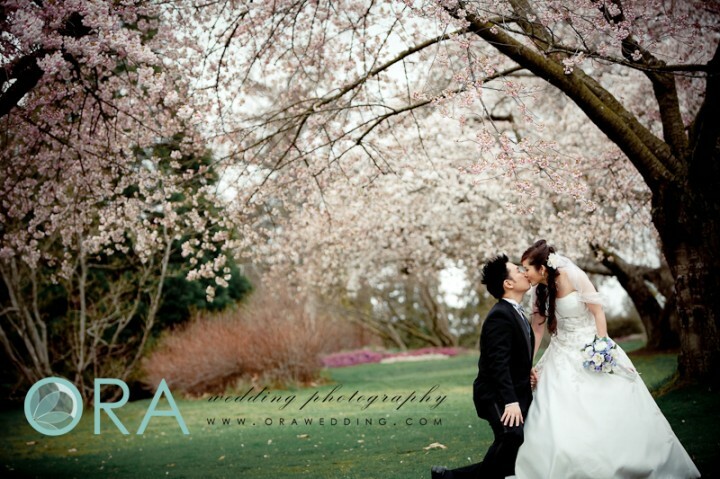 To have a pre-wedding photo shoot with cherry blossoms must be good luck, because they are a symbol for luck, love, and affection. 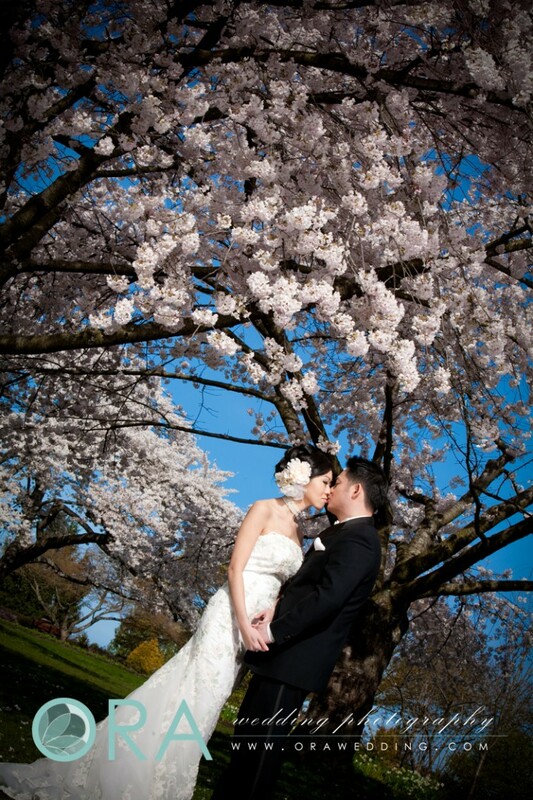 For those of you who don’t know, Vancouver’s cherry blossoms are world-renowned, which makes it easy to see why it is one of the most desirable choices for our pre-wedding couples, especially those who want a backdrop that is both romantic and unique to Vancouver. Vancouver holds an annual cherry blossom festival in the spring – this year’s celebration will be March 26 to April 22 2011. We are home to over 20 species of cherry blossom trees, and the two most common are Yoshino Cherry (white blossoms) and Kanzan Cherry trees (dark pink blossoms). There are approximately 37,000 cherry blossom trees in Vancouver -wow! Cherry blossom trees often get mistaken for plum trees, further complicated by the fact that both look quite similar and bloom around the same time. How to tell the difference? The bark on cherry trees have horizontral lines, and plum trees are more fragrant. Cherry blossoms are an omen of good fortune, and represent love and affection. They are commonly associated with new beginnings and the “bloom of something new”. 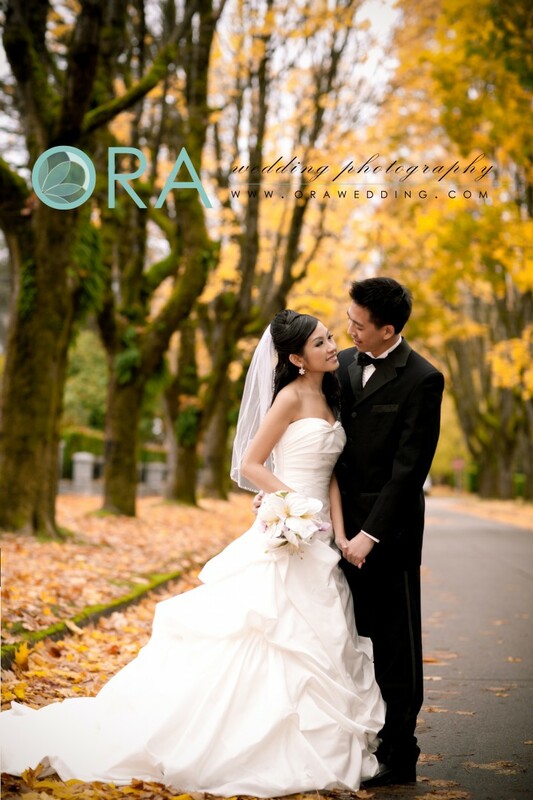 Perfect for pre-wedding photos, wouldn’t you say? Do you want white blossoms or pink blossoms? The white blossoms are more common in Japan (Yoshino) while the dark pink blossoms are North America’s most popular cherry blossom tree. Both are beautiful, but have a bit of a different look. Some people want colour, while others like the softer look of white blossoms. 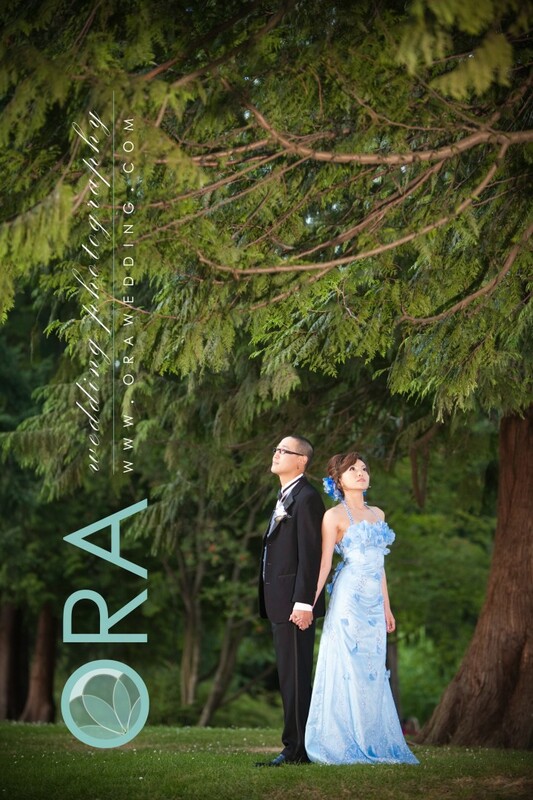 Pre-wedding gown: There are two ways to go in terms of choosing the perfect dress to go with the cherry blossoms, depending on what style you prefer. #1 simple with clean lines or #2 big, bold and beautiful. 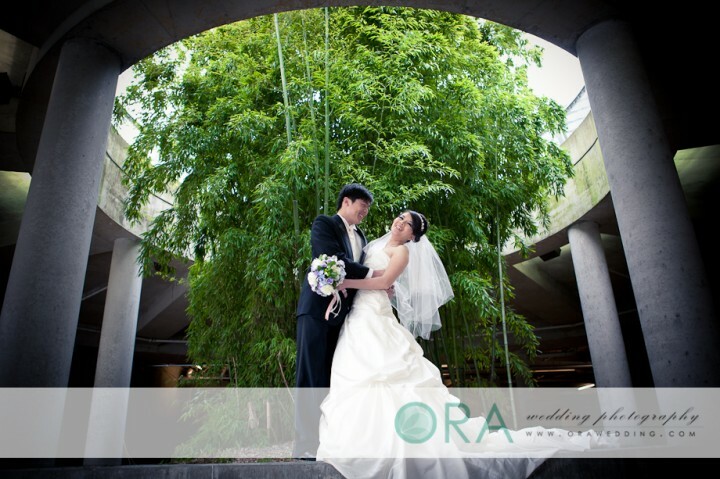 Two things to consider though: in order to get the beautiful landscape shots, most beading and detailing won’t be visible, also, you don’t want to choose a dress that competes too much with the natural beauty of the cherry blossoms. 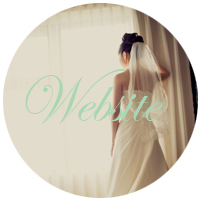 Don’t worry though, our consultants will help you choose the perfect gown. Big tip: Aside from being one of the most beautiful of seasons, it is also one of the most cold! Don’t be deceived by the pictures, remember to wear warm leggings underneath. For more examples from 2010, check out our facebook album. 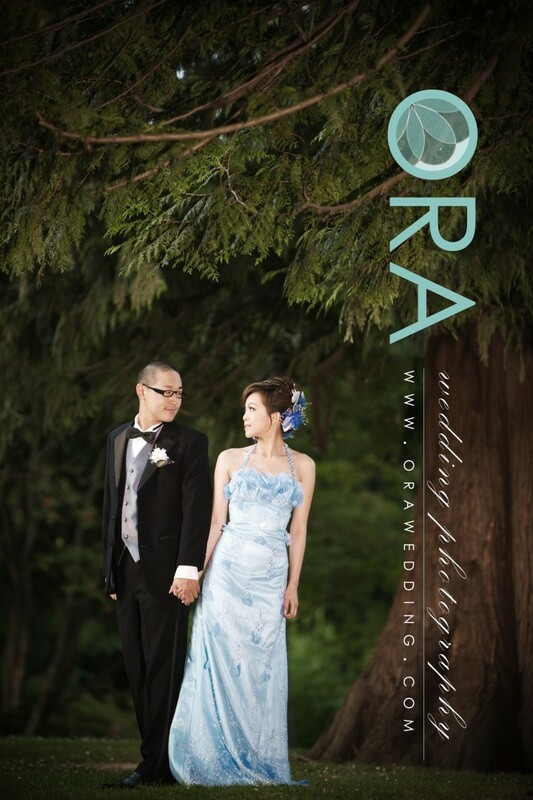 We always joke that with each pre-wedding shoot, and with each wedding, that it will be our last for the season. After all, who wants to take photos in the blistering cold? 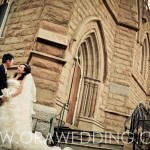 Well, we had such the opportunity this year with Ivy and Jason – remember the sneak peek from our last post? Our team consisting of photographer, photographer’s assistant, and makeup/hairstylist braved the cold two weeks ago during the short but memorable snowfall, in minus 5 weather. In the end, the photos were definitely worth it. Do they even look cold? Not at all. Here’s to our last pre-wedding shoot of the season (though stay on the look out for photos from our last wedding shoot, coming soon)! In one word: amazing. Congratulations Ivy and Jason! And we really hate to say this because winter hasn’t even started yet, but we are so excited for spring and summer to roll around – more weddings, more beautiful brides, and more sun. Because of the snowfall last week, we were able to catch the beautiful snow for the final season of 2010 (even though it is technically still fall – definitely feels like winter though). So we are all wrapped up for pre-wedding photo shooting this year, lest anyone wants to be out there in the freezing cold, for hours, wearing a wedding gown. Take a look at what we’ve been up to this year: spring, summer, fall and winter 2010. Enjoy. P.S. If you want to book your pre-wedding session for next year, now is definitely the time so you can get in on your season of choice! 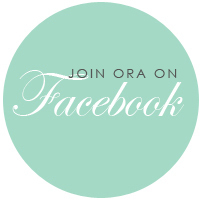 Please e-mail info@orawedding.com for details.